It's such a released when everything is over. After months of preparation and it is over. Im happy and now i am officially married to a man that I Love so much. SO the day 29 August 2009 start as early as 5.30 which i took my shower at 5.30 am. Jeff was staying overnight at home so he woke up as early as me..hhehehe..so the makeup session start at 6am. Benny reached home before 7 and makes the room happening. then Alex the videographer came and makes everything merrier. well, i dont feel nervous at all. Fiancee Sms me that morning telling me the he was nervous, but not me.We(maid of honour, Benny, ALex and Jeff) laugh, shouting and teasing each other in the small room. the mass was ended successfully and i can see there are a lots of my friends from SMSM, UMS and Labuan Matriculation College. And i am really happy. The church is almost full. Which i afraid it will look empty, but i was wrong. SO hubby and me went back home to change my wedding gown and his coat. 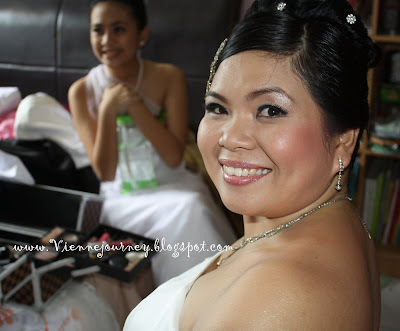 we took about 30 minutes to get ready to go to Tun Fuad Hall, Penampang for the lucnh reception. I am happy i can see lotsa people came and say Congratulation. I am happy...i never feel this much happy. The reception was ended with joy. So we heading back home at 5.00 pm and ready for the wedding party. Guess what. 3 of my friends flat and sleep at the other room. HAHAHA...oo yaa, Allen our classmate that we haven't see for like 8 years was there too. Hubby and me just happy that everyone was there for us. we feel blessed by all people around me. To Jeff, u makes me gergous that day, i love ur makeup. Congratulations to you and hubby! Congratssss..........may both u live happily ever after..God bless. congrats oto..siou x dpt stay lama tym tu..
congrates...hope you live happily ever after..
Hi Vienne, congratulations. You look absolutely sensational. And that smile of yours can light up 5 houses too. Wishing you the very best, lots of good health and happiness for always. Lee. better late than never huh?? may GOD will always b the center of both of u lives and HE will guide u both in ur marriage life..
vienne.. congrats to you once again! ^_^ can't wait for pics & vids already kan? hehehe..